In ‘First Aspect of Layering Using Spring BeanFactoryLocator’, we have seen how to approach layering using spring. One can have separate application Context for each of the above layers. In this article, we will further modularize the code by pushing the concerns dealing with layering to a framework, so that the application module can just focus on the domain and avoid getting into the technicalities of layering. However the challenge lies in the framework module to allow placeholder of XML context files which the application module can override with its own set of context files. Let’s start with our example but first a bit about the setup. Each layer will have its own ApplicationContext definition and beanRefFactory.xml will contain the respective ApplicationContext beans with their context files. If you want to know more about the layering, please read my article ‘First Aspect of Layering Using Spring BeanFactoryLocator’ Spring BeanFactoryLocator’. The bean that defines domain layer’s ApplicationContext. Note that the list of XML files that the domain layer is made up of are a composite of framework module and application module’s domain context files. This is defined by bean compositeList. frameworkContextList and appDomainContextList are beans representing List of context XML files. appDomainContextList is an empty list and will be overridden by the application module. How do we allow overriding the bean? We use an import of another beanRefFactory.xml which will be application specific. Here is the complete beanRefFactory.xml. For the framework module to successfully load the beanRefFactory.xml, we will have an empty appBeanRefFactory.xml file. Let’s make sure we can find a framework specific domain object. Application module will provide the actual appBeanRefFactory.xml. Each domain context file contains domain specific beans. Let’s now fetch application specific domain objects. 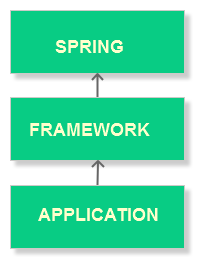 This was an example about pushing spring specific stuff to a framework module and making the application module extend the framework to plugin its own context files.